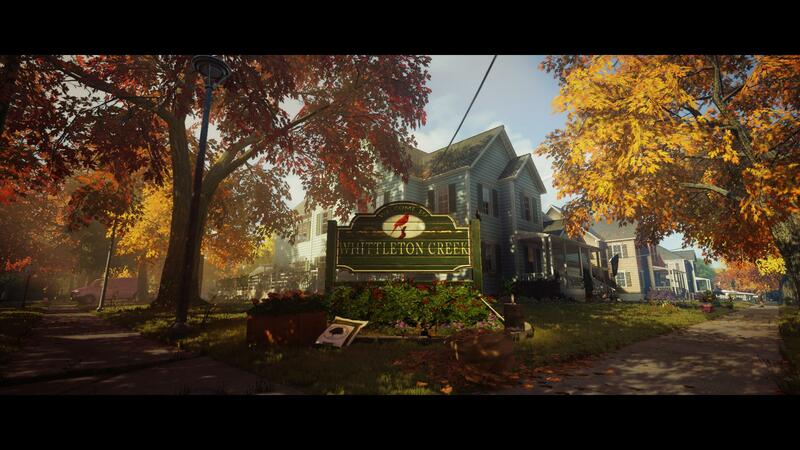 Whittleton Creek is the fifth mission in Hitman 2 and reintroduces Agent 47 to the suburban setting that worked so well in the brilliant “A New Life” mission from Hitman: Blood Money. Those of you familiar with that stage will find a lot of similarities here, especially the heavy security presence guarding a valuable target living nearby. 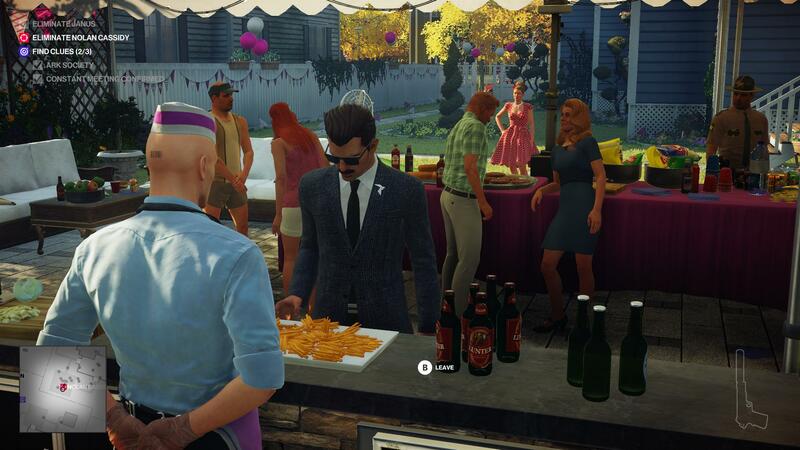 As a new resident, Agent 47 is looking for a way to ingratiate himself as a worthwhile member of the community while eliminating two key targets. Our Hitman 2 Whittleton Creek guide will help with just that goal. If you are just starting out, you might want to familiarise yourself with some tips on starting load-outs how to be an effective assassin in our Hitman 2 guide hub. But for everything else associated with the Whittleton Creek mission, read on. In the “Another Life” mission, your objective is to eliminate an ex-Constant of the shadowy Providence organisation named Janus and the overzealous leader of his security detail Nolan Cassidy. You also need to search for three clues that will reveal Janus is still involved with current Providence activities and help track down the current leadership. IO’s pristine recreation of idyllic Americana is itself is quite small, with many of your main points of focus being the houses that each have some implication in every objective you’re seeking to complete. Surrounding them, though, is lots of open space, which makes it easier for you to move freely between each point of interest while also scouting your targets from afar. A tight-knit residential area is rife so gossip too, so take full advantage of that by casually wandering in and out of conversations that can reveal a lot of potential opportunities for you to reach Janus, Nolan Cassidy, or hints as to shady dealings of the mysterious pair. And remember, just because its a friendly residential area doesn’t mean people like you nosing around too much in their affairs – especially in the high-security areas surrounding Janus’s home and Nolan Cassidy’s base of operations. Janus is perhaps the toughest of the two as he does not leave his home much further than the back garden. As such, rather than waiting for an opportunity for him to come to you, you’re going to have to create an situation where you can get to him. Fortunately, there are a handful of ways for you to get into his residence and end his life. One way is to disguise Agent 47 as his nurse. You can find the nurse lazing around by the creek at the most southerly point of the map. Janus has regular check-ups due to his declining health and you can make this one his last. Be wary of the guards that will want to run a background check on you before you see him alone, meaning you’ll have to sneak out of confinement and finish the job with Janus before they discover you are an imposter. If that sounds too risky, you can exploit one of the reasons for his declining health and encourage his smoking habit. The guards are trying to stop him from puffing away, but if you leave a fresh pack of cigarettes on his table and loosen the bolt on his oxygen tank (remember to bring a wrench! ), you can set up an explosive end. Speaking of explosions, you can even “fix” the mole infestation in Janus’s garden by filling the holes with bombs. That’ll be a surprise when he comes to inspect the job you’ve done. As for Nolan Cassidy, he’s the total opposite of Janus and can usually be found on the move. As he’s so focused on his protection job, he’s not too fussed getting caught up in the community spirit, but you can encourage him to attend the nearby BBQ for some free food – grub that you will undoubtedly have interfered with first. Elsewhere, you can take advantage of the fact he’s looking to expand his security operation by purchasing additional property on the street. If you take on the role of the local real estate agent you can give him a guided tour of a new house that’s just come available on the market with some very advanced security measures. A quick demo for the man himself will leave him dead impressed. Alongside the assassination of your two targets, you’ll also need to search the area for three clues as to Janus’s current connection with the Providence organisation. There are a number of potential items nearby to assist in that objective. Lawsuit papers – Turns out that Janus and a local resident James Batty are engaged in a dispute about the former using an area containing endangered wildlife as a helipad on a suspiciously regular basis. You’ll find the documents in Batty’s shed in his back garden. Surveillance tape – A surveillance tape with a recorded conversation between Janus and the current Constant can be found in the security room of the Cassidy property. If you head through the open garage it’s the first room you enter. Once you’ve collected it, you’ll need to go to the attic of the Lewinsky building opposite to find a tape player to listen to it. Letter to Janus – In that very same security room is a letter from Janus that will insinuate a connection between him and the enigmatic-sounding “Ark Society”. 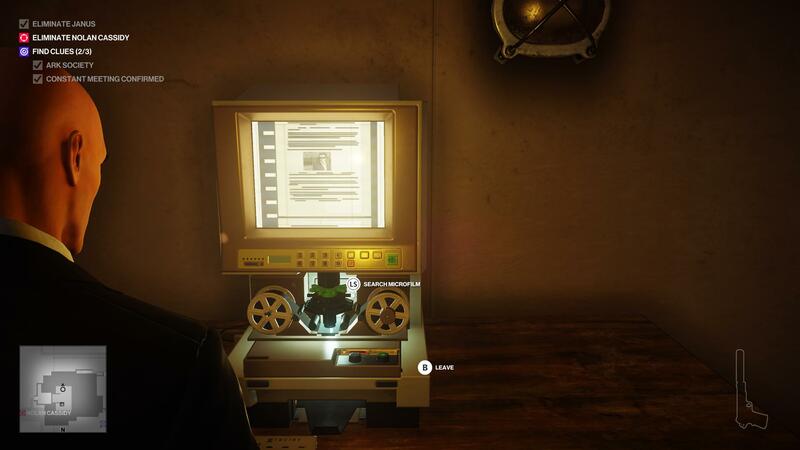 Microfilm – In Janus’s library in the upstairs of his house you can find an old piece of microfilm that shows a connection between him and Providence. You’ll need to take it to the Wilson house, where you’ll conveniently find a microfilm viewer in their attic. Janus’s diary – One of Janus’s bodyguards must’ve been looking for some light reading and decided to take the former spy’s diary for a quick flick during his lunch break. You’ll find him casually turning pages on a bench by the creek in the bottom left corner of the map if you want to borrow it from him. Ceremonial robes – In the West property, Helen has been making a set of ceremonial robes for Janus. If you try them on yourself, you’ll find a note that suggests he’ll be wearing them to a Providence meeting soon. Seriously, what is it with shadowy organisations and their ceremonial robe nonsense? Cassidy Property – Used as a base for Nolan Cassidy’s security operations so you can often find him roaming around here. The ground floor is where the most interesting items can be found, including a couple of clues needed to fulfil your mission objective and the CCTV hub where you can wipe the area’s security footage. Upstairs is fairly barren outside of an alarmed armoury holding a few heavy weapons. Janus Property – Home of your other target, Janus. Naturally, it is swarming with security, making it extremely difficult to sneak in unnoticed, so it’s recommended you find a disguise to infiltrate it. More clues related to Janus’s connection with Providence can be found here too. Schmidt Property – This property can be used in the House for Sale mission story as an opportunity to off Nolan Cassidy in rather dramatic fashion using the home security system. Apart from that, it’s mostly empty. There’s a tree house in the garden which serves as a decent sniper position if you’re looking for a way to complete the Sniper Assassin challenges. Wilson Property – The overly familiar Wilson family is hosting a BBQ where the whole neighbourhood is invited. The garden is where you’ll find the main party, including the opportunity for you to serve food as part of the Charbroiled mission story, or overhear a conversation about the microfilm viewer in the attic. You’re free to roam up there too, as the Wilsons are extremely trusting! West Property – In this home you’ll find a lovely woman who has been baking all the muffins for the locals to enjoy. She’s also a dab hand towards sewing too and she’s just picked up an interesting commission from Janus. It’s a rather regal looking robe that only emphasises his connection to Providence’s current dealings even more. Whittleton Creek – The creek itself is right at the bottom of the map and is surprisingly busy with things to see. Going from east to west, you have the mailman who starts the Breadcrumb Trail mission story, Janus’s nurse feeding the ducks by the water and a Janus security guard who is reading the old spy’s diary. Protected Reservoir – This area resides at the back of the Cassidy and Batty households and it has become a point of contention between the two owners. It’s extremely overgrown and designed as a habitat for the nearby frogs. All that foliage makes it good to sneak through, while some of the frogs you can find inside can be used as deadly poisons. Public Park – You’ll find a politician campaigning here, which isn’t all that interesting on its own. Disguise yourself as him, though, and you can have a bit of unusual fun canvassing the neighbourhood in his place. Cassidy Bodyguard – There are loads to pick from, but it’s best if you slip behind the fence to the Cassidy house and find a bodyguard patrolling the garden there. Subdue him, steal the disguise and hide his body in the nearby bushes. Janus Bodyguard – Many of these are dotted around the neighbourhood too; the easiest to get is from the bodyguard reading on the bench by the creek in the bottom left of the map. Wait for the garbage men to look away and you can take him out quietly. Nurse – The nurse that tends to Janus can be found conversing with the ducks on the creek at the bottom of the map. While he talks to the animals you can knock him out, nab his uniform and drag his body into the nearby shed to hide it. Exterminator – The exterminator can be found loitering around his van at the front of the Batty residence. He’s standing directly in front of a bush, which is the perfect place to hide his body once you’ve subdued him and stolen his clothes. Gardener – The gardener can be seen having an argument with the local police in front of Janus’s house about trying to use explosives to kill some moles. Naturally, the cops aren’t too keen on his extreme methods, so when he walks off in a huff back to his truck you can take on his identity yourself. Server – There are two easy ways to get this disguise. The first is from a Server hiding upstairs in a small room in the Wilson house. You can knock him out and hide his body in the nearby bedroom. The other server is already on the muffin stand in the top right of the map. Lure him into the bushes by turning on the radio and claim the disguise for yourself there. Real estate broker – You can find the real estate broker scoffing away on free samples at the muffin stand. Slip a little poison in one to upset his stomach and he’ll take a long trudge to a nearby bin to throw up. It’s the perfect quiet place to bonk him on the head and take his swish clothes. Rat poison – There are a few locations you can find some in the level but the easiest place is in the garage of the house opposite the muffin stand. Flip the switch on the outside wall to open the door and it’s on a box near the back. Remote CX detonator – Needed for the Whack-A-Mole mission story if you didn’t smuggle your own explosives into the level. You’ll find some stashed by the police car in the roadworks at the top left of the map. Sneak in behind the barriers and grab it when no one is looking. Propane flask – Needed for one step of the Charbroiled mission story. You can sneak into the garden of the bottom left house to steal one, but it’s much easier to grab one from shed opposite the statue by the creek at the bottom of the map. Loop around, jump through the window and you’ll spot it resting on the side. Microfilm viewer – Needed to view one of the clues you collect when hunting for connections between Janus and Providence. It’s in the attic of the Wilson house, which is ideal as you can move through it freely. The ladder to reach it is in the kid’s room – you’ll recognise it by the giant TV and all the American football paraphernalia. Wilson house key – Speaking of the kid’s room in the Wilson house, that’s also where you’ll find the Wilson house key. It’s on a side table by the door. Janus house key – Many of his security guards will be carrying one if you take them out, or you can find one on the gardener wandering around outside his house. There’s also one on the side table by the front door if you should need one after you’re inside. Batty house key – The exterminator carries a copy of the Batty house key, who is conveniently placed right outside the home by his extermination truck. Cassidy house key – Seems the exterminator is collecting all the keys. You’ll also find a Cassidy house key on him if you knock him out. Insecticide – Found in the construction site in the bottom right of the map. You’ll need to break into the green storage crate with a crowbar to collect it. Rake – You can find one of these on the back of the gardener’s truck opposite Janus’s house, should you wish to recreate the hilarity of Sideshow Bob’s famous misfortune with the gardening tool. 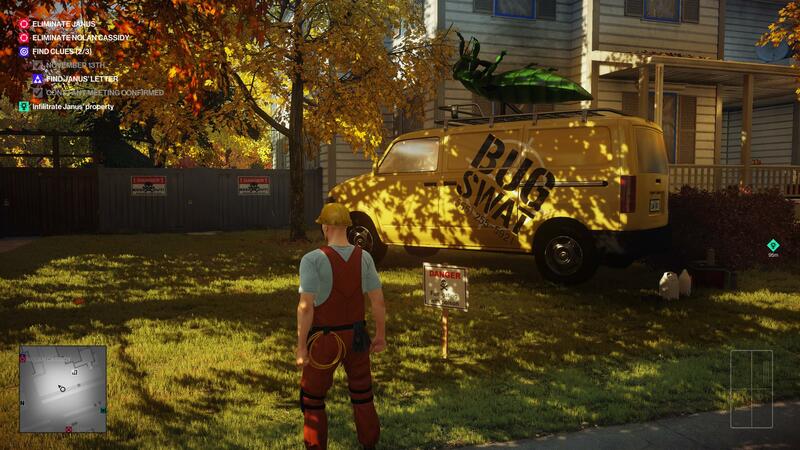 If you’re having trouble getting into some houses, remember that Agent 47 is an athletic individual and will be very good at hopping over fences to sneak into places. The local key cutter must be making some serious bank with all the keys to different houses people are carrying. If you’re stuck trying to get anywhere, just take out someone vaguely related to the specific building and there’s a good chance they’ll drop a key for you. There are multiple poison types available on the level, from emetics and sedatives to lethal toxins. Make sure you use the right type depending on your intention. If you want to make yourself laugh furiously, lure someone into walking onto a rake. With all the construction going on there are multiple tools for you to collect and make use of, so just gather up one of each if you find them. Searching for leads to your secondary objective and eliminating your targets often go hand-in-hand, so try to collect clues while infiltrating important buildings, rather than just focusing on one task at a time. Remember: an efficient assassin is a good assassin. Now we’re approaching the end game and your next destination is a secretive island you can read all about in our Isle of Sgàil guide. You can always jump back to our Hawke's Bay location guide if you want to take the mission once more, or for that extra challenge you can head to our Whittleton Creek Silent Assassin guide. Alternatively you can always return to our Hitman 2 guide hub for any more of your assassination needs.